Satellite tracking is unlocking the mystery of exactly where humpback whales feed on krill, highlighting the need for increased protection of the Western Antarctic Peninsula – a feeding hotspot. A map based on the tracking reveals humpbacks rely heavily on the peninsula for feeding and resting. This information is part of a new WWF-University of California Santa Cruz report entitled Whales of the Antarctic Peninsula. 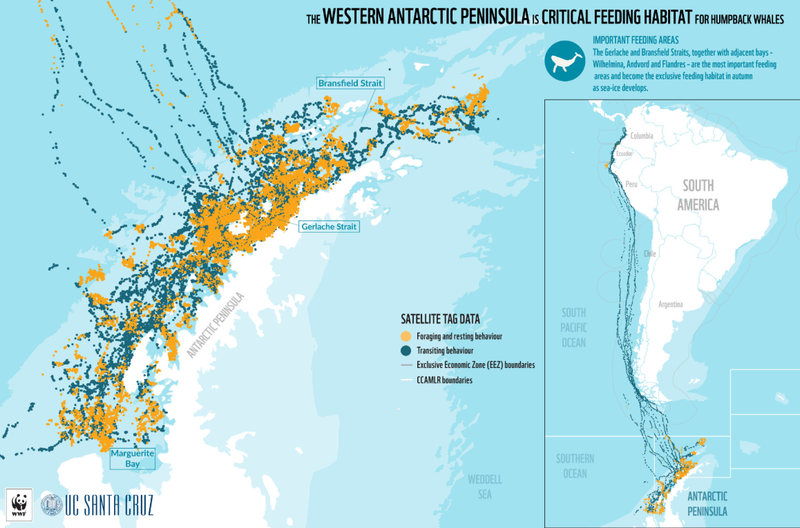 Satellite tracking is unlocking the mystery of exactly where humpback whales feed on krill, highlighting the need for increased protection of the Western Antarctic Peninsula – a feeding hotspot. A map based on the tracking reveals humpbacks rely heavily on the peninsula for feeding and resting. This information is part of a new WWF-University of California Santa Cruz report entitled Whales of the Antarctic Peninsula. 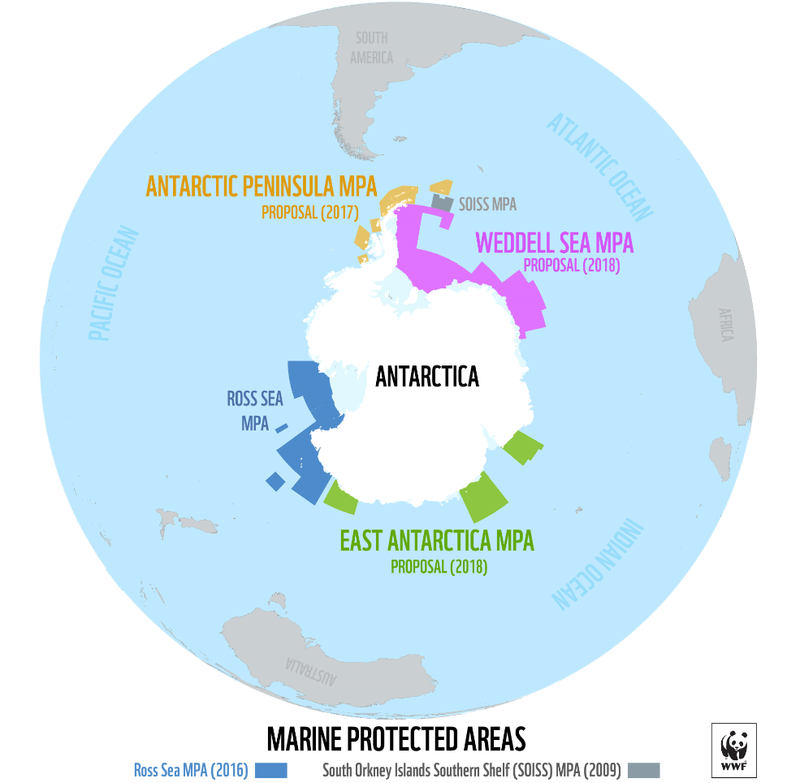 The report has been released on the eve of the annual Commission for the Conservation of Antarctic Marine Living Resources (CCAMLR) meeting*, which will consider new proposals for Marine Protected Areas, including one in the Antarctic Peninsula. “As our report explains, the Antarctic Peninsula and its amazing wildlife is under increasing pressure from climate change, krill fishing and a growing tourism industry,” said WWF Antarctic Program senior manager Chris Johnson. “We’re in a race against time to protect these waters before it’s too late. The creation of a network of Marine Protected Areas along the peninsula is crucial to help safeguard Antarctic wildlife for years to come,” he said. Mr Johnson co-authored the report with University of California Santa Cruz associate professor Dr Ari Friedlaender, who conducted the satellite tracking, and graduate researcher Michelle Modest who visualised the analysis. 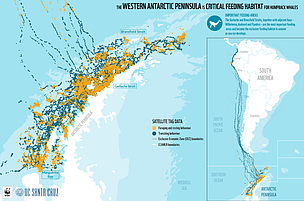 “The tracking shows that while there are feeding hotspots, nearly every part of the Antarctic Peninsula is important to humpbacks,” Dr Friedlaender said. “They are either foraging, resting or traveling between feeding spots. Doing this efficiently and without disturbance is critical to add the necessary energy stores to sustain them for the rest of the year when they migrate to tropical breeding grounds. “In autumn, the whales follow the movement of krill and concentrate in the straits and bays close to shore. During this time the whales increase their feeding rates to add the last remaining energy stores. “However, the krill fishery similarly follows the krill inshore placing them in direct competition with whales for the krill and also placing the whales at risk from disturbance or ship strikes,” Dr Friedlaender said. Dr Friedlaender and his team deployed over 60 satellite-linked tags on humpbacks in the Antarctic between 2012-2017 covering the entire feeding season from January to July. Mr Johnson welcomed the recent pledge by krill fishing companies to voluntarily stop fishing in parts of the peninsula and their support for the creation of an MPA. “Even with these voluntary closures, krill fishing will still occur alongside humpbacks feeding in the peninsula.To protect Antarctica, WWF urgently calls for CCAMLR to establish a comprehensive, effective network of marine protected areas surrounding the continent – including no-take marine sanctuaries,” Mr Johnson said. While increasing Antarctic tourism poses some risks, WWF also recognises the sector can be incredibly useful to scientists. WWF has therefore partnered with Apple to create Wildcrowd – a new mobile and web app to collect wildlife sightings. Naturalists and field guides working in the polar tourism industry, and tourists themselves, will be able to record sightings of species including whales, penguins, seals and seabirds.This will help scientists better understand specific locations for species, the interaction between predators and prey, and how a changing climate is impacting critical feeding habitats. * The 37th meeting of the Commission for the Conservation of Antarctic Marine Living Resources (CCAMLR) will be held in Hobart from Monday, 22 October 2018 to Friday, 2 November 2018. 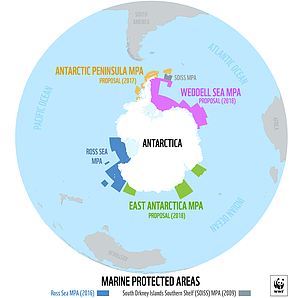 It will consider proposals for networks of Marne Protected Areas in the Antarctic Peninsula, East Antarctica, and the Weddell Sea.